Today a billion people, including about 340 million of the world's extreme poor, are estimated to live in 'fragile states'. This group of low-income countries are often trapped in cycles of conflict and poverty, which make them acutely vulnerable to a range of shocks and crises. This engaging book defines and clarifies what we mean by fragile states, examining their characteristics in relation to "weak" and "failed" states in the global system, and explaining their development from pre-colonial times to the present day. It explores the connections between fragile statehood and violent conflict, and analyses the limitations of outside intervention from international society. The complexities surrounding 'successes' such as Costa Rica and Botswana - countries which ought to be fragile, but which are not - are analysed alongside the more precarious cases of the Democratic Republic of the Congo, Afghanistan and Haiti. Absorbing and authoritative, Fragile States will be an invaluable resource for students and scholars of international relations, security studies and development. Lothar Brock is research professor at the Peace Research Institute, Frankfurt. Hans-Henrik Holm is professor and head of department at the Danish School of Media and Journalism. Georg Sørensen is professor of political science at Aarhus University. Michael Stohl is professor of communication and political science at the University of California, Santa Barbara. 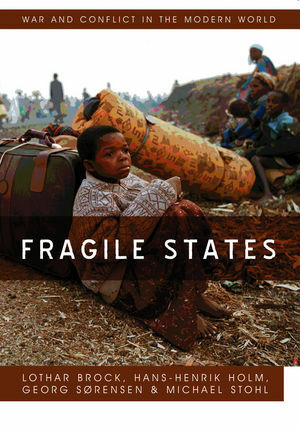 "The authors have done a superb job unpacking the complexities surrounding the concept of 'fragile state'. The scholarship is first-rate. Highly recommended." "A very important book, tightly argued and brilliantly written, two qualities rarely found in a work by four authors of several nationalities. It is committed neither to an ideological orthodoxy, whether neo-liberal or neo-Marxist,nor purely descriptive or historical. It is both theoretical and empirical, both firm and nuanced. This small book is worth a whole library of studies on nation-building, fragile states and foreign interventions." "An invaluable analysis which, in addition to imparting a deep insight into the complex nature of fragile states, gives a coherent historical framework which defines political trends in today’s era." "A very readable and practically oriented approach to understanding the issue of state fragility." "A valuable contribution to the literature, analysing conflict and development in the modern era. The comprehensive historical information for each case study is of particular note, ensuring a clear and reasoned discussion of highly complex issues." "The authors offer a concise and robust introduction to fragility without falling into the trap of oversimplification." "An empirical triumph with policy relevance - truly unique in our field." "Largely based on the analyses of selected country studies, this important investigation into the roots of state fragility brings out results which question the need for further development assistance and instead find arguments for changes in, for instance, farm policies of rich countries. Particularly noteworthy in this book is the inclusion of cases that have avoided the state fragility that has afflicted neighboring countries. This gives further food for thought on how insightful governance can escape the dilemmas of state fragility." This accessible book explains and clarifies the debates surrounding contested terms such as 'fragile', 'weak' and 'failed' states, with reference to a global range of examples.